I’m always on the prowl for historical Gravesend tidbits (thank you for not reminding me to get a life), and I’m always stunned by what’s out there, waiting to be drawn into the present. I’ve learned to look for information everywhere, not in just the usual published sources or image collections. 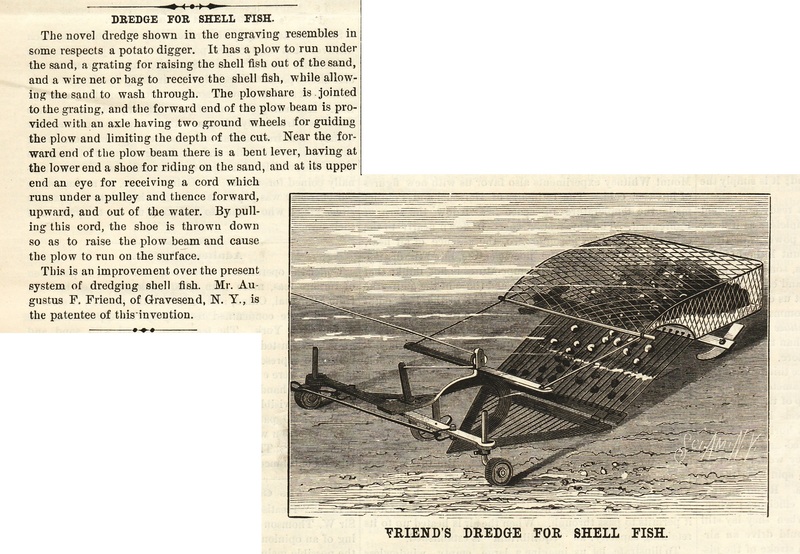 Check out these reports from Scientific American about patents issued to two Gravesend inventors for a steamer and presser, a shellfish dredge, and a skewer puller. Who knew our sleepy little burg harbored such creative folk? Tagged as Augustus Friend, dredge, milliner, potato digger, presser, shellfish, skewer puller, steamer, Thomas Hicks Jr.
On October 8, 2015, the New York City Landmarks Preservation Commission (LPC) will hold a public hearing to determine if the house at 27 Gravesend Neck Road — known as Lady Moody’s House — meets the criteria for landmark status. Despite what many locals believe, the house is not an official landmark. That means it is not protected by law, and could, conceivably, be torn down by some uncaring developer. (If you’d like to be its guardian, the house is currently for sale!) However, the house has been on the LPC’s radar since 1966, when it was “calendared.” That provides a modicum of protection in that any application for demolition should send up a red flag, spurring the LPC to action. But they’ve had half a century to decide. After the October hearing, a public meeting in early 2016 will determine the next step, which — fingers crossed — will hopefully lead to designation of this most iconic of Gravesend houses. What follows is my open letter to Meenakshi Srinivasan, chair of the New York City Landmarks Preservation Commission, urging her to act now. I beg you all to drop a line, however brief, to the LPC, by the October 1st deadline (whether or not you plan to attend the hearing), stating your support for the house. The more of us they hear from, the better. Take a look at the LPC’s informative fact sheet about the house (even I learned some things! ), then write to backlog95@lpc.nyc.gov. I’d love to read your thoughts if you’d care to copy me (webmaster@gravesendgazette.com). Oh, and don’t miss the gallery of wonderful images at the bottom of this post! 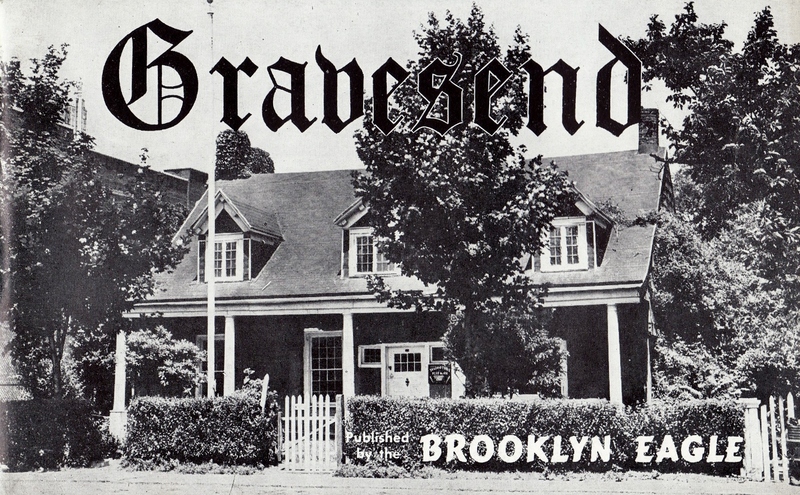 The Brooklyn Eagle featured the Lady Moody – Van Sicklen House on the cover of its 1947 booklet of Gravesend history. Ask anyone in Gravesend, Brooklyn where Lady Moody lived. Invariably they’ll point to the house at 27 Gravesend Neck Road, just next to Public School 95. How do they know she lived there? A teacher told them. Or their grandmother. And who was Lady Moody anyway? Oh, she helped George Washington escape the Redcoats through a tunnel running from her basement to the cemetery across the street. And during the Civil War she hid slaves in that tunnel on their way north to freedom. None of this happened, of course: Deborah Moody died late in 1658, nearly seventy-five years before the birth of Washington, and over two centuries before the Civil War. The general public, knowing instinctively that Lady Moody bore some significance, but lacking specifics, attaches her — and the house at 27 Gravesend Neck Road — to the seminal events of American history. Moody’s fellow patentee, the surveyor James Hubbard, designed the town’s central plan: a sixteen-acre square bounded by present-day Village Road North, Village Road East, Village Road South, and Van Sicklen Street, and cut into quadrants by the intersection of McDonald Avenue and Gravesend Neck Road. In each quadrant ten house lots bordered a common yard for holding livestock. Records show that in 1646 Lady Moody was assigned a double lot in the northwest quadrant, corresponding (in part) to the modern street address of 27 Gravesend Neck Road, Brooklyn (block 7123, lot 64). Lady Moody must have built a house on her property between 1646 and 1658. Is the house standing there today the one she occupied? A structural evaluation conducted in 2005 by Robert Silman Associates, Consulting Engineers, suggests the present building incorporates three phases of construction: The part most visible — Phase 2 — is an eighteenth-century “random rubble [stone] building supporting hand-hewn wood floor beams and simple log beam roof trusses.” Phase 3 reflects the early twentieth-century changes made by then-owners William and Isabelle Platt, who excavated a full basement under the ground floor, added dormers to the roof, and stuccoed the exterior to conform with the prevailing Arts and Crafts aesthetic. But evidence of an earlier structure, one possibly dating from the seventeenth century, is visible in the basement, where there are four stone bearing walls, three of which support the current above-ground walls. The fourth lies buried beneath the main house and its rear extension. This “out-of-place” wall led Silman Associates to hypothesize that the Phase 2 house is a reconfiguration of an older building, a Phase 1 house that was enlarged in the 1700s. Was this Phase 1 house Lady Moody’s? Or was it built by one of the later seventeenth-century owners of her land? We may never know. But its expanded form — the rubble-stone Phase 2 house — is probably the work of the Van Sicklen family, who came into possession of the property in 1702. Most eighteenth-century houses in sandy, coastal Gravesend were of wood-frame construction. Stone houses tended to be built near ridges, where appropriate-sized boulders were plentiful. 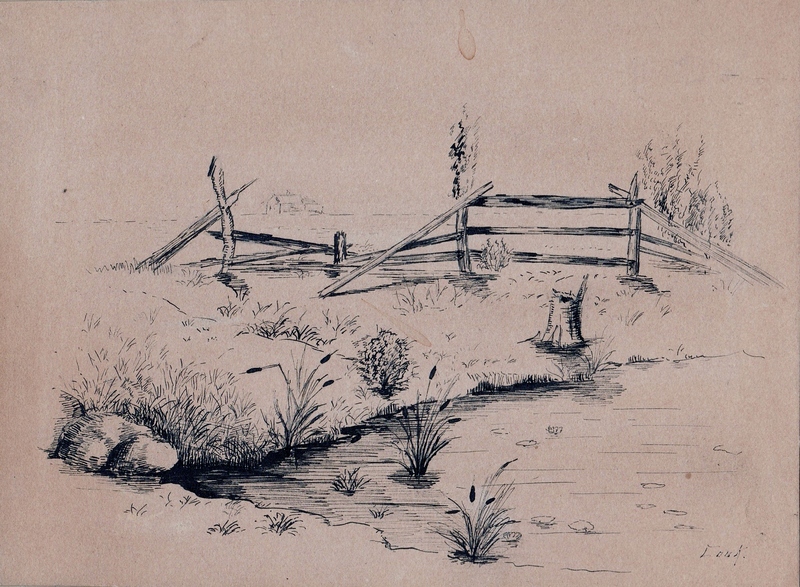 To build a stone house at a location where rubble was scarce required significant manual labor, and the Van Sicklens, who, like most Dutch farmers of the period owned slaves, likely employed those slaves to transport rock to the site. The Van Sicklen family occupied the house for the rest of the eighteenth century and through most of the nineteenth. Eventually it descended to Cornelia Van Sicklen, whose husband, Thomas Hicks, acquired it in 1842. (His carved initials survive on a ceiling beam near the eastern ground-floor fireplace of the house.) Hicks died in 1884, and his wife followed in 1893. The house sat vacant for a time, and then served briefly as meeting place for the fledgling Gravesend Methodist Episcopal Church in 1899. In 1904 the Hicks estate sold the house to William and Isabelle Platt, whose renovations resulted in a romanticized Dutch farmhouse set in a lush garden, which Mrs. Platt profiled in the June 1909 issue of Country Life in America. The Platts were the first to call this the “Lady Moody Homestead,” a name it has kept for more than a century. The Landmarks Preservation Commission calendared the property in 1966, but a hearing that year did not result in designation. Nor did subsequent hearings in 1970 or 2004, due to owner opposition. 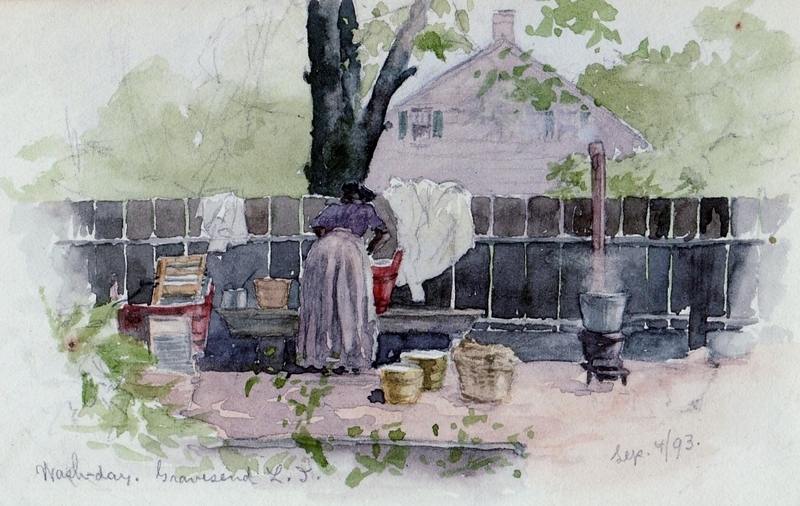 But the Commission has designated other sites when faced with similar resistance (e.g., the Hendrick I. Lott House at 1940 East 36th Street in Brooklyn), and in cases where the fabric of a structure has been significantly altered (e.g., the asphalt-shingled Sandy Ground cottages at 565 and 569 Bloomingdale Road on Staten Island). And the recent designation of the Stonewall Inn, birthplace of the modern LGBT movement at 51-53 Christopher Street in Manhattan, illustrates that the Commission is cognizant of the historical associations of a building, even when its architectural integrity has been compromised. Despite the changes it has weathered, the Lady Moody – Van Sicklen House remains the sole surviving eighteenth-century stone farmhouse in Brooklyn. It is one of two extant Dutch-American houses within the boundaries of the original Gravesend town square, where as late as the 1920s there were seven. It sits directly opposite the landmarked Van Sicklen Family Cemetery, which holds the remains of many generations who occupied the house. At the very least, it stands on the property of the remarkable Lady Deborah Moody, the first European woman to found a community in North America, a settlement chartered on the principle of religious freedom some hundred and thirty years before the signing of the Declaration of Independence. I trust you will seize this opportunity to recognize publicly, formally, and legally, the significance of this site tied inextricably to the themes of Brooklyn history, Women’s history, American slavery, and religious freedom. Without landmark protection the house is doomed. Map of the Gravesend village square showing in red the house lot allocated to Lady Moody in 1646. Map of the Gravesend village square showing in red the location of Lady Moody’s house lot in 1907. 1909 photograph of east gable end and main facade showing Platt renovations. 1912 photograph showing landscaped grounds and Platt renovations. 1927 photograph showing main facade prior to the addition of columns. 1945 photograph showing columns added to support overshot roof. The Lady Moody – Van Sicklen House as it appears today. Captain HENRY R[OBERT]. WILLIAMS, one of the assessors for the town of Gravesend, was born on November 22, 1840, in New York City, but his parents moved to Brooklyn when he was nine years old. He attended one of the public schools until he was fifteen, when he engaged in the printing business. he worked as a printer until the civil war [sic] began, and in the spring of 1861 enlisted as a private in the 14th Regiment. His attention at all times to his duty and his bravery in the field soon won him the approbation of his superiors, and he passed rapidly through the different grades until he attained the rank of first lieutenant in 1862. In January, 1863, he served as acting assistant inspector-general of a brigade, in the First Army Corps, and thence was transferred to the command of the Balloon Corps of the Army of the Potomac. 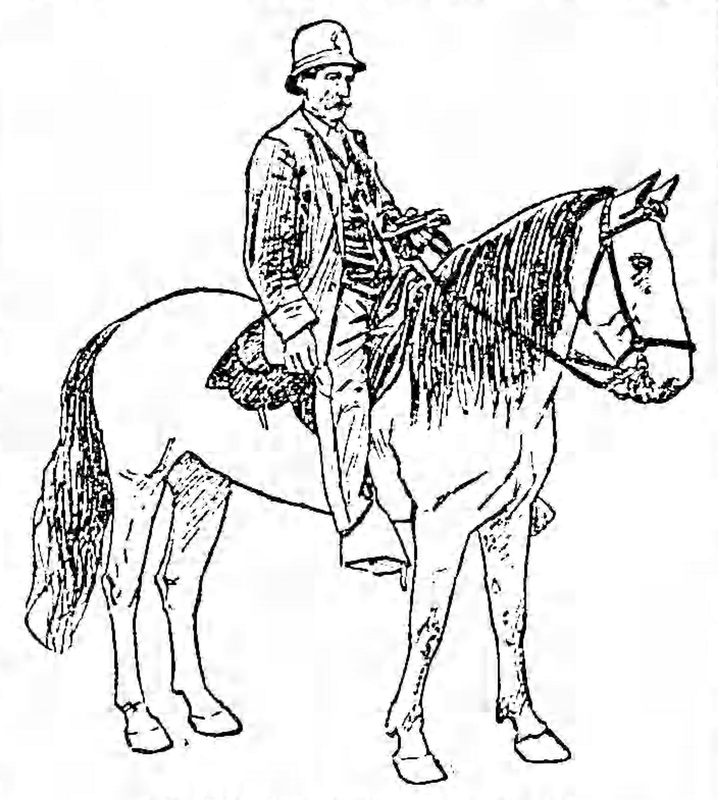 While serving on the staff of Major-General French, 3d Army Corps, he was severely wounded in the leg, near Culpepper [sic] Court House; when convalescent, he was transferred to the Veteran Reserve Corps, and thence to the 45th U.S. Infantry, finally retiring from the service in 1871. he then took up his residence in Buffalo, remaining there until 1886, when he removed to Gravesend and began to deal in real estate. Four years ago he was appointed to fill the unexpired term of one year as a member of the board of assessors, and subsequently was reappointed for a further period of three years. 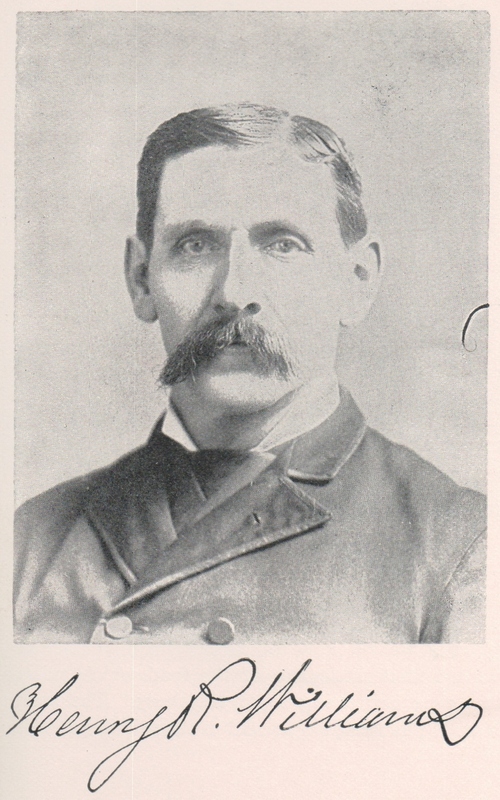 Captain Williams was president for two years of the Republican Association of Gravesend, of which he is now the secretary; he was a delegate to the national Republican convention, in Minneapolis, in 1892, and to the New York State Convention. He is connected with Long Island Post, G.A.R. [Grand Army of the Republic], and with Coeur-de-Leon Encampment, Knights of Malta.